The high-throughput screening laboratory at the Hauptman-Woodward Medical Research Institute in Buffalo, New York, is a facility that is used to identify crystallization conditions for biological macromolecules. This facility makes use of automated liquid handling and imaging systems coordinated through a LIMS/database to quickly set up and record the outcomes of 1,536 unique crystallization screening experiments. How long has the laboratory been in operation? The high-throughput crystallization screening laboratory accepted the first samples for crystallization in February 2000. How many crystallization experiments have been set up in the high-throughput laboratory? From February 2000 to February 2015, the laboratory has been used to set up ~23 million crystallization experiments on more than 15,000 biological macromolecules. We have the capacity to set up 100 samples every month against 1,536 crystallization cocktails. How do you achieve high-throughput? We achieve high-throughput by aspirating solutions from source plates and delivering them, in parallel, to wells in high-density microassay plates. Details of the screening method are available in the literature (A deliberate approach to screening for initial crystallization conditions of biological macromolecules, Luft JR, Collins RJ, Fehrman NA, Lauricella AM, Veatch CK, DeTitta GT, J. Struct. Biol. (2003), 142, 170-179). 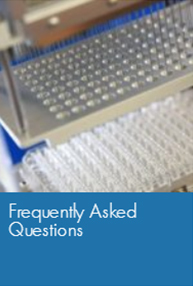 What types of samples are accepted for screening? We screen an increasingly diverse set of biological macromolecules to identify crystallization conditions. This has included both soluble and membrane proteins as well as protein complexes. How pure should the sample be for the screening? The sample should be monodisperse by dynamic light scattering (Crystallizing proteins – a rational approach? D’Arcy (1994) Acta Cryst D50, 469-471). Sample stability is as important as initial purity. We strongly encourage verification that the sample will remain stable for a period of time after purification. If the sample rapidly decomposes, a solution environment with the proper pH and chemical additives to stabilize the sample should be identified prior to crystallization efforts. How much sample is required for screening? We require 500 μl of solution at a suggested concentration of 10 mg/ml. The actual sample concentration will vary with the solubility of the individual samples. We recommend using a pre-crystallization screening test, such as the Hampton Research PCT to determine a protein-specific sample concentration. How should I prepare the sample for screening? From a crystallization perspective, the solution would ideally be pure water. This permits the cocktail to dominate the solution environment and dictates the chemistry of the crystallization experiment. Often, it is necessary to add a low concentration of buffer or other chemical additives to stabilize the protein for crystallization trials. Co-factors and inhibitors can help to stabilize the three-dimensional conformation of the molecule and can be an effective way to improve crystallization of the sample. Things to avoid are high concentrations of strong buffering agents and additives known to form insoluble compounds with the crystallization cocktails. (Phosphate and borate are good examples of this.) It is imperative to prepare the sample solution environment where it will be stable for several days. How should I ship the sample? This depends on the sample’s stability. We receive samples on both wet and dry ice. 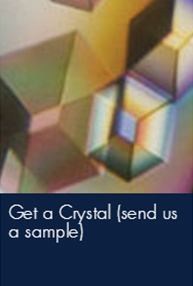 For details please see the Submit a sample page for the Crystallization Screening Center. There is a fee that covers the cost of setting up the screen for each sample. 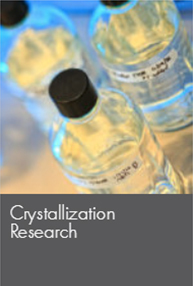 Why is it beneficial to set up crystallization experiments using high-throughput methods? By using automated liquid-handling systems, we are able to set up crystallization experiments precisely and reproducibly using a minimum volume of macromolecular solutions that are often difficult to obtain. The laboratory personnel start with samples contained in a microcentrifuge tube and, within 10 minutes, are able to set up 1536 unique, microbatch-under-oil crystallization experiments. Setting up the same 1536 experiments manually would take a technician several weeks to complete. This speed is truly advantageous, greatly reducing the time available for sample degradation prior to the crystallization experiment. Finally, by setting up so many chemically diverse crystallization experiments, we increase the likelihood of identifying more than one crystallization condition. Crystals produced from different chemical cocktails will often have different physical properties. The ability to choose from several different initial crystallization conditions provides the researcher with multiple paths to pursue when faced with downstream bottlenecks. These downstream bottlenecks can include: ease of optimization, X-ray diffraction quality, and the ability to cryo-preserve the crystals for data collection. What is a microbatch under oil and why do you use it? Microbatch-under-oil is a simple crystallization method developed by Naomi Chayen, Patrick Shaw-Stewart and David Blow (See An automated system for micro-batch protein crystallization and screening, Chayen NE, Shaw Stewart, PD, Maeder DL. and Blow, DM. J. (1999) Appl. Cryst. 23, 297-302; and Microbatch crystallization under oil — a new technique allowing many small-volume crystallization trials, Chayen NE, Shaw Stewart PD and Blow DM. (1992) J. Crystal Growth, 122, 176-180). It uses oil to encapsulate an aqueous experiment drop to prevent rapid dehydration of the experiment. Paraffin Oil is relatively water impermeable and reduces the dehydration rate of the aqueous experiment drop. Silicon-based oils are more water permeable and allow the drops to dehydrate at a faster rate. Mixtures of paraffin and silicon oil can be used to regulate the rate of dehydration. Different types of oil can be used to regulate the rate of water loss from the experiment drop (A novel technique to control the rate of vapour diffusion, giving larger protein crystals, Chayen NE. (1997) J. Appl. Cryst. 30, 198-202). Why do you use microbatch-under-oil? Microbatch-under-oil was chosen as the crystallization method for the high-throughput screening laboratory because of its efficiency and amenability to automation. We use Paraffin Oil purchased from EMD Chemicals Inc. (catalog number PX0045-3). What cocktails are used in the standard (soluble) protein screen? Commercial screens purchased from Hampton Research include: PEGRx HT, PEG?Ion HT, Crystal Screen HT, Index, Salt Rx HT, Silver Bullet with PEG3350 pH 6.8 precipitants, Grid Screen Ammonium Sulfate, modified Slice pH, modified Ionic Liquids, modified Polymer screen.Please Note: The Ionic liquids screen was modified with the addition of 0.09M buffer and 27% (w/v) PEG 3350. The Slice pH screen was modified with the dilution of the buffer from its initial 1.0 M to 0.5M concentration with the addition of 15%(w/v) PEG 3350 to promote supersaturation in the batch experiments. The Polymer Screen was formulated using 24 polymers 200≤Mr≤200000 at 2 concentrations all in 10% (v/v) Tacsimate pH 7.0. How do you record the experiments’ outcomes? Outcomes of the screening experiments are recorded using custom-built imaging systems. We have three automated-imaging systems. Two of them are located in a laboratory at room temperature (~23°C). The third table is located in a temperature-controlled room. Each table holds a maximum of 28, 1536-well microassay plates, and the plates are imaged at a rate of 45 minutes per plate. The latest version of the software that controls the tables was written at the Hauptman-Woodward Institute by Raymond Nagel. When do you record the experiments’ outcomes? Experiment plates are imaged immediately before adding the protein solution when they contain only the crystallization cocktail solution. This provides a control that can be used to ascertain the ‘quality’ of an initial crystallization hit. If crystalline-like material appears in the plate prior to the addition of protein solution, it is not a hit that should be pursued. Plates are also imaged at the following intervals after addition of the protein solution: one day, one week, two weeks, three weeks, four and six weeks. Why do you image the plates more than once? 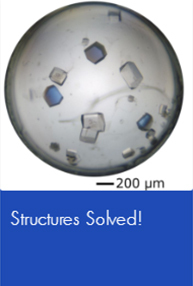 The outcomes of crystallization experiments will change over time. The microbatch-under-oil experiments are, as the name implies, ‘batch experiments’. However, they are not ideal static batch experiments. The experiment drops will slowly dehydrate. As they dehydrate and the volume decreases, the relative concentration of any non-volatile solute increases. This can decrease the solubility of the biological macromolecule. It can drive a drop that is not sufficiently supersaturated for spontaneous, homogeneous nucleation (undersaturated, saturated, metastable) to a point where it is sufficiently supersaturated for crystallogenesis. What types of outcomes can be expected from the screening experiments? Each image of a crystallization well can be classified into seven predefined categories or their combinations. These categories are: clear, phase separation, precipitate, skin, crystals, junk and unsure. With the exception of “clear”, combinations (two or more) of all the other categories are allowed. Examples of most of these categories are pictured below. Image classification into these categories has been discussed in considerable detail in two High Throughput Screening Center publications (Establishing a training set through the visual analysis of crystallization trials. Part I: approximately 150,000 images, Snell EH, Luft JR, Potter SA, Lauricella AM, Gulde SM, Malkowski MG, Koszelak-Rosenblum M, Said MI, Smith JL, Veatch CK, Collins RJ, Franks G, Thayer M, Cumbaa C, Jurisica I, Detitta GT (2008) Acta Cryst. D64, 1123-1130 and Establishing a training set through the visual analysis of crystallization trials. Part II: crystal examples, Snell EH, Lauricella AM, Potter SA, Luft JR, Gulde SM, Collins RJ, Franks G, Malkowski MG, Cumbaa C, Jurisica I, DeTitta GT (2008) Acta Cryst. D64, 1131-1137). How do you track the samples? All of the data from every experiment is tracked through a secure, custom designed database/LIMS. We run control experiments to track the conditions of the cocktails and the robotics so that we can perform quality control. We generally have very low experimental error (under 5% and more typically < 1%) and use the controls to rapidly identify and address any issues that arise. How do you avoid data loss, in particular for the image data? Image data is archived with multiple fall-over systems to avoid data loss. These systems include tape and optical disc backup of the image data to minimize any risk of data loss. How do I get my image data? An email is automatically generated by our database as soon as your experiment plate has been imaged and packaged to notify you that your outcomes are ready to review. During the imaging of a microassay plate, 1536 individual TIFF images are sent from the reader table to a file server. The image data are processed and packaged with a file that contains the chemical cocktails associated with the experiments. The TIFF images are converted to JPEG format and placed on a secure ftp server for password-protected access by users. The results are available to geographically distant investigators as soon as they are available in-house. How do I view my image data? Image data can be viewed using MacroscopeJ, a program that was developed at the Hauptman-Woodward Institute and is available free of charge. The software is java-based for multi-platform compatibility. This software has a significant number of new features from the old Macroscope program that was used in the past. Please go to the Analyzing Results tab to download the MacroscopeJ program and manual. Can you recover crystals from the plates? It is very difficult to recover crystals from the 1536-well experiment plates. The wells are small (~2 mm square at the top, 0.9 mm circle at the bottom with a conical interior. Manipulation of the crystals to remove them from the well often results in destruction of the crystals. However, we have had some recent success by removing the microscope objective lens from the area where crystal manipulation and harvesting occur (A new view on crystal harvesting, Luft JR, Grant TD, Wolfley JR, and Snell EH (2014) J. Appl. Cryst. 47, 1158-1161). How can I tell if it is a protein or a salt crystal? We have integrated a Formulatrix Rock Imager 1000 with SONICC into our High Throughput Crystallization Screening Center pipeline. Through this instrument, we have imaging technologies that can be used to determine if an object is crystalline [second order non-linear imaging of chiral crystals (SONICC); Haupert LM and Simpson, (2011) Methods, 55, 379-386] and if it is protein [UV-two photon excited fluorescence (UV-TPEF); Madden JT, DeWalt EL and Simpson GJ (2011) Acta Cryst. D67, 839-846). Positive (white) signal from these independent imaging technologies can verify protein nanocrystals < 1 μm in size. This imaging takes place only once, at either 4 or 6 weeks. What crystallization cocktails are currently in use? Please go to the Crystallization Cocktails page to download the complete list of our current and/or most recent crystallization cocktails for soluble and membrane proteins. How do I translate from microbatch-under-oil to vapor diffusion? First, ask yourself if this is really necessary. 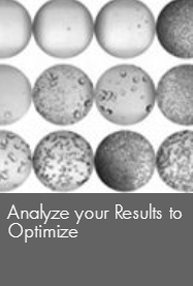 Although you may prefer other methods, there are some real advantages to using the same crystallization method for screening and optimization. There is information available on converting from microbatch-under-oil to vapor diffusion experiments available in the literature (Comparative Studies of Protein Crystallization by Vapour-Diffusion and Microbatch Techniques, Chayen, NE (1998), Acta Cryst D54, 8-15). When you set up a batch experiment by combining equal volumes of protein and cocktail solution, you are diluting any solute not contained at the same concentration in both solutions. For example, if the protein concentration was 10 mg/ml in the stock solution, it will be 5 mg/ml in the batch crystallization experiment. Ideally, batch experiments will not dehydrate. The starting and final concentrations of the protein in the batch crystallization experiment remain at 5 mg/ml, unless a phase change (e.g. crystallization, precipitation) occurs and drives some of the protein from the solution state. In the case of a vapor diffusion experiment , this same dilution occurs when you combine the protein and cocktail solutions to prepare the experiment drop, and the protein concentration was 10 mg/ml in the stock, it will be 5 mg/ml at the start of the vapor diffusion experiment. The experiment drop will be left to dehydrate over a reservoir solution (typically, but not necessarily, the cocktail). This reduces the volume of the experiment drop. If no phase change occurs, the final concentration of protein in the experiment drop would be ~10 mg/ml after the vapor phase equilibration is completed. How do you make the cocktails, and how can I reproduce them in my lab? We purchase commercial screens directly from Hampton Research and the MemGold screen for membrane protein samples from Molecular Dimensions. All of our other cocktails are prepared in house or custom made by Molecular Dimensions by making up concentrated stock solution of PEG, salt, and buffer. The individual components are combined and diluted, if needed, to prepare the individual cocktail solutions. The pH of the buffer stock is adjusted prior to combining the stock solutions to prepare the cocktail solution. The majority of our samples come from structural biologists. More than 1,000 structural biologists have signed up to be on our mailing list. We collaborated with structural genomics groups, including the Structural Genomics of Pathogenic Protozoa (SGPP) and the Northeast Structural Genomics Consortium (NESG), to develop and improve our technologies to determine initial crystallization conditions. Are you planning to develop any new image viewing software? We are continually developing the new MacroscopeJ program and expanding on the analysis features that it offers. Notification will be sent to members of our mailing list as soon as new versions and features are available. What information do you track for macromolecules submitted for screening? We track the information supplied by users on the Sample Submission form. We have collected and entered this data for more than 16,000 samples that have been set up in high-throughput crystallization screening trials.